It’s also a good thing to take a hostess gift when you attend a party (any time of the year). It’s the polite thing to do, and it shows the hostess how much you appreciate being invited. Whether it’s a pretty apron or body scrubs so your hostess can pamper herself, or a custom serving platter or a foodie subscription, bringing a gift to the hostess is good thing to do. Plus, if your hostess throws great parties, it will be a good way to get you invited again. Just saying. Flirty Aprons – An apron (especially a pretty one like this one) is a gift that you know will come in handy over the busy holiday season. Order your apron & see the other choices here. Decade candy box – Bring your host or hostess back to their childhood by choosing a Thank You box with candy from the decade of your choice. Perhaps they’ll share so that you can reminisce together. Choose your decade here. Covered cheese dish – An adorable white porcelain cheese dish that can come out every time your hostess entertains. Buy it here. Sugar scrub tower – A beautiful assortment of 6 different sugar scrubs for the hostess to pamper herself once all the guests have left. Find this gift idea by Lalicious here. Gilded trophy bowl – Very simply, a beautiful and elegant vessel to place anywhere in the home and use as wished. Find it here, along with other fab gift ideas from Pure Home. Glass cocktail shaker – Cocktail season is upon us. You want your hosts to be ready! Add a bottle of hooch and mixers if you wish to go all out. Buy the cocktail shaker here. Reclaimed soda bottle glasses – For your stylin’ eco-conscious hosts, they will be sure to enjoy these glasses made from real glass soda bottles. Find the reclaimed glasses here. Salt & pepper cellars – A wonderful and pretty hostess gift that will certainly make its way on to the next dinner table. Buy here. Cashmere throw – If you’re a house guest for a few days, a luxurious gift that the host might not buy themselves will fit the bill. Like this cashmere throw. Cozy too. See it here. Custom serving platter – Personalized gifts are the best. They demonstrate that you went the extra step and put some thought into the gift. Like this platter with the host’s family’s last name (or other inscription). Order it here. Re-wined candles – A clever way to reclaim old wine bottles: as jar vessels filled with natural soy wax that has been carefully blended with aromas of white grape, honey, freshly baked bread and a spritz of citrus. Buy it here. Taste Trunk’s monthly foodie subscription – Chances are that if your hosts invited you for dinner, they like to cook. In which case, they will really appreciate a single or even a monthly subscription to Taste Trunk, a box subscription service for foodies. Find out more. What’s your favorite hostess gift to give and/or receive? 42 Responses to Going to a Party this Holiday Season? Don’t Forget a Hostess Gift! Those are all awesome ideas. I have a party to go to this Sunday and I am thinking that one of those Re-wined candles might be fun! I love to give a gift that is meant for the person. My BBF gets wine – neighbor gets homemade treats. Thanks for the suggestions – I am always looking for new ideas. Love all these creative ideas. A bottle of wine isn’t always welcome so it’s nice to have a good list of alternatives. These are GREAT ideas for a hostess, I’d love any, especially a cute new apron!! These are all great ideas. Sure beats the bottle of wine or other beverage many people bring! I’m going to be hosting Thanksgiving, hope that means I get a hostess gift 🙂 Such great ideas – love the apron! An apron is always handy! A personalized tray is a good idea too. That apron is absolutely adorable! I would love to receive one as a hostess gift. Such great ideas! I never know what to put in baskets or give to a hostess so this is great help! That apron and the personalized platter are so cute. I’d love to receive either of those! These are all great ideas. I never go anywhere without a host/hostess gift. I am the worst at remembering hostess gifts. These are great ideas! OH I love the apron. These are some great gift ideas. I’ve thrown a lot of parties and have never received a hostess gift. However, I like to give food or candy gifts when I attend a party! Flirty Aprons could be used for girls’ nights. It depends on who is giving the party. Usually wine or candles. All great ideas. Love putting things together for the hostess. I never show up to a party empty-handed but bringing a bottle of wine isn’t always appropriate. Thanks for these great hostess gift ideas! I almost always bring a bottle of wine with me when I go to someone’s house. But these are fun ideas! I love surprising hosts with little gifts. These are definitely great ideas for the next holiday party! I love aprons. I have 2 and would love for someone to bring me more as a gift. They certainly get used. I love the flirty aprons! I want matching ones for me and my girls! The apron is the BEST!!!! i do have some holiday parties and gift swaps I need to start thinking about in advance. I love giving and receiving fun hostess gifts. I’m loving that Decade candy box idea! I know several who would love it. Great ideas! My mom taught me to always bring a hostess gift when I was invited to someone’s home. It is surprising to me how many people don’t do it, so I love that you are writing about this. Great gifts! I’ll keep this in mind for my next hostess gift. I like to give wine, flowers or a pretty wine holder. I like the idea of a monthly food subscription or a pretty apron, too. Great suggestions. Those are great hostess gift ideas! I’ve a few parties to attend, so I’ll be checking the list again. I am not really sure. I haven’t received many hostess gifts, nor have I given many. Is that sad? 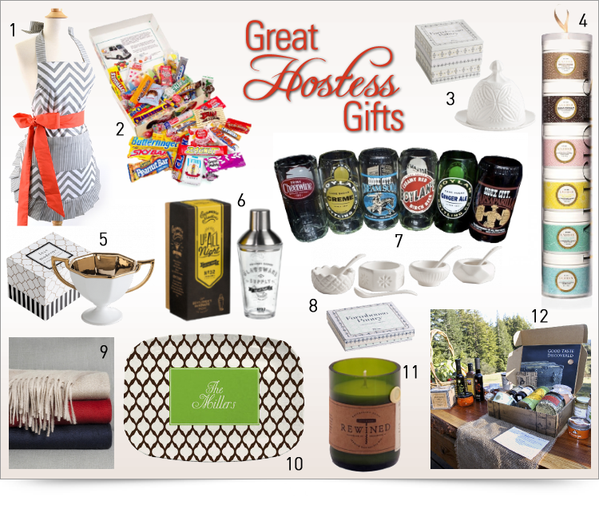 So many great hostess gift ideas! I usually struggle with gifts, so it’s nice to have a list to choose from. I may just have to show them this so they can get the hint…. I think a custom service platter would be such a great host/hostess gift idea. They’ve got so many cute/great options out there too! Those are some great hostess gift ideas. I usually throw the parties and ask my family to help out with a dish. Thanks for sharing the art of providing a gift for the hostess, especially for the holiday season! I love the Sugar Scrub Tower! These hostess gifts do look amazing!! I love that they are easy to gift and pretty cheap! These are all great ideas to give to the hostess this holiday gathering! I love that they are all relatively affordable options too! I am always looking for gifts to buy and these are some great ideas. During these months is when I attend more parties. Love that they are affordable too. Thanks for post. Love the gift ideas! I usually struggle with gifts , thanks for the list. You have some wonderful ideas for gifts. Thank you so much for sharing them with us. These are great ideas. I usually bring wine. These are all great ideas and I especially love the cheese dish. My mother taught me to never attend a party or event empty handed.